When all of the teeth are present in both jaws, there is stability. Teeth are not actually rigid in the mouth, but stay in place due to a complex series of pressure contacts and eruption forces. This series is broken when a tooth or teeth are lost or missing, and one of the possible effects is overeruption of the opposing teeth. Let’s take a look at how this occurs. Side view of upper and lower jaw teeth. 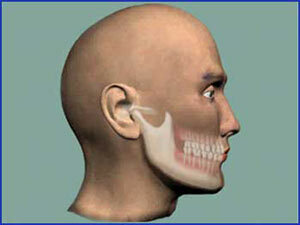 The presence of all teeth creates stability in the jaw. Two lower molars missing in the jaw, disrupting the series of contacts and pressures of the teeth. 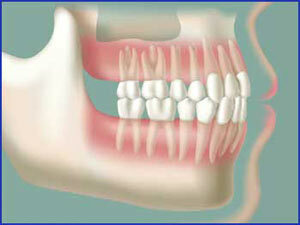 Without the counter forces of the bottom teeth, the top teeth may overerupt. 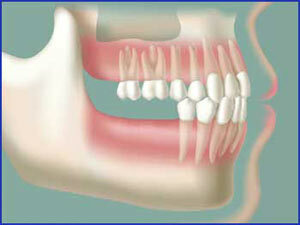 If you have lost one or more teeth, dental implants might help you restore the function and beauty of your mouth. To learn whether you are a dental implant candidate, schedule a personal appointment with one of our implant surgeons by calling us or request a free consultation. In addition to providing dental implant treatments, all of our dentists are skilled periodontists who can provide a complete evaluation of your gum health and perform any necessary gum treatments.